You might have missed it in all the Whitecaps news and rumours that was buzzing around yesterday, but the new USL League Two schedule was released on Thursday (or the PDL as us old timers will still have a tough time not calling it!). That means Vancouver TSS Rovers’ third season is all set, so you can add another layer of planning to your social calendars. Rovers will once again play 14 regular season matches, in an unbalanced schedule that sees them play every team three times apart from Victoria, who they only play twice this year. 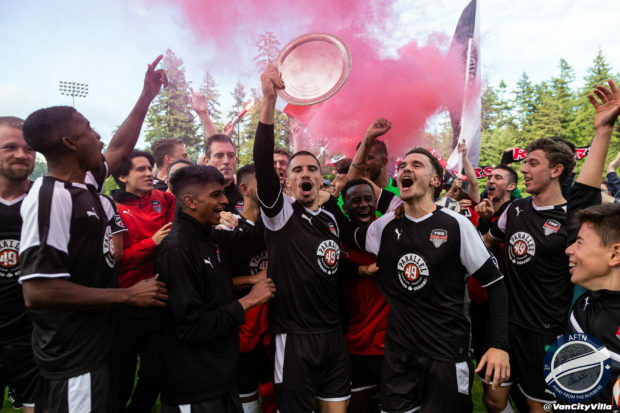 Those two matches against the Highlanders are, of course, for the Juan de Fuca Plate, and the Rovers will be keen to hang on to the silverware after winning it for the first time last year. With Victoria heading to Swangard on June 7th, the deciding match this season will take place on the island, with Rovers heading to Centennial Stadium on Friday July 5th. This year marks the 25th season of the league, and the six team Northwest Division of the Western Conference has consistently been one of the strongest in all of the USL. This year looks to be no different. The 2019 MLS SuperDraft saw three players from last year’s division picked in the top four – Portland’s Siad Haji (picked 2nd overall by San Jose), Seattle’s Santiago Patino (picked 3rd overall by Orlando), and Victoria’s Callum Montgomery (picked 4th overall by FC Dallas). Another two went later in the first round, with SFU Clan’s Mamadi Camara, previously of TSS Rovers and Calgary Foothills, going to San Jose in the second. The first Rover to be draft! Quite an impact for the Northwest Division on the draft. The playoff criteria has not yet been confirmed, but with the competitiveness of the division, along with Calgary being the reigning USL League 2 champions, my understanding is that the teams have pushed for two guaranteed playoff places, instead of just the Division winner and then hoping to get in with the next best record. We’ll see how that plays out, but we’re looking forward to another season. AFTN will once again be the official media partners of Vancouver TSS Rovers, providing season long coverage here on the site and commentary at all home matches. Season and individual tickets for the season will be on sale soon, with at least one friendly match also getting penciled in.